JOE ROOT’S dismissal to the penultimate ball of the fourth day was a hammer blow to England’s chances of salvaging an unlikely stalemate in the first Test against New Zealand at Eden Park. Root (51) had dug in manfully to sow belief England might yet achieve the mighty improbable here. But after he was caught-behind down the leg-side from a vicious Trent Boult delivery, England closed on a downer, 132-3 and still a yawning 237 behind after conceding a monstrous first-innings lead of 369 in New Zealand’s inaugural day-night Test. How the tourists needed a captain’s innings after his predecessor Alastair Cook had gone cheaply for the second time in the match to leave them 6-1 in reply to the Kiwis’ 427-8 declared - on the back of a career-best, unbeaten 145 from Henry Nicholls. Up until the last over, Root answered the call emphatically to revive motivational memories of the Matt Prior-inspired backs-to-the-wall rearguard of their last Test visit to Auckland - when they hung on through 143 overs with nine wickets down to close out a thrilling draw and a 0-0 series scoreline. This time, home captain Kane Williamson left England with 148 to close out - and with Cook gone so early, then Mark Stoneman (55) giving himself away with a faulty hook at Neil Wagner one ball after counting six with the same shot, Root represented perhaps the last credible hope of clambering out of the chasm. This was a hole England had burrowed, of course, in those calamitous 20.4 overs of their first-innings 58 all out on day one. They were since indebted to the elements for taking 150 overs out of their unlikely bid to escape Auckland with a stalemate, and their first intent when play did resume under sunny skies was to stall the start of their second innings as long as possible. It was therefore perhaps a mixed blessing when Stuart Broad (3-78) had BJ Watling edging a loose drive behind - because his replacement was the big-hitting Colin de Grandhomme. He should have gone for only eight to Chris Woakes, whose run of misfortune in this match continued when a feint inside-edge behind was not detected. De Grandhomme was therefore able to accelerate the process for the Kiwis until he went caught-behind instead to Craig Overton, from an attempted leg-side mow. Todd Astle helped Nicholls in another handy stand until Broad had him playing on via inside-edge, pad and crease. Then just before tea, Nicholls completed his painstaking but impressive century - having hit 11 fours from 228 balls. Williamson’s decision to delay the declaration until an hour before dinner was not to everyone’s liking. But it perhaps made sense to give England minimal prospect of sneaking some sanctuary by nosing back in front at any point on the final day, and Tim Southee and Nicholls accepted the invitation to extend the tourists’ misery in the field with an eighth-wicket stand of 73. England’s second innings then started as badly as the first, Cook caught-behind down the leg-side off Trent Boult. Suddenly, after 141 overs of the ball steadfastly refusing to move off straight, in New Zealand’s hands it was veering sideways in the air and appeared to be bouncing unpredictably too. There were false shots but no edges, from Stoneman especially but also Root. The final session brought the extra complication for England of anticipated help for the seamers under floodlights. 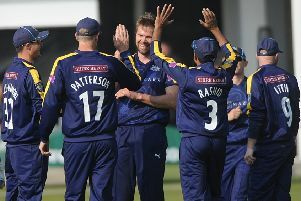 Their second-wicket pair responded, however, with an 88-run stand of increasing assurance until Stoneman momentarily lost the plot. Root completed his 121-ball half-century to keep hope alive alongside Dawid Malan, only to be struck a painful blow to his right index finger - and then fall to what proved to be the last ball of the day as Boult homed in to perfection again.